… Well, *without* TV is hyperbole, but a month into the new year, and I’ve stuck to my New Year’s Resolution to not watch TV on weeknights. Truthfully, I slipped one time: Joel and I really wanted to watch The Martian but weren’t able to spend any time together over a weekend, so I relented and we watched it on a Tuesday night. But that still leaves 19 out of 31 days that I didn’t watch any TV – not bad! 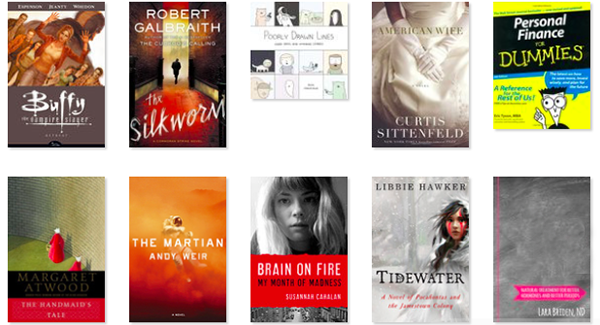 But I still need something to keep me entertained, so I read ten books in January (and have nearly finished another.) (Never you mind that two of those I started in 2015, and two were graphic novels!) I think I’ll write a longer post about my reading habits, but in a nutshell, I fell far short of my 2015 goal to read 48 books; and I’ll read way more than 48 this year if I keep up this pace. The Handmaid’s Tale by Margaret Atwood – an old favorite that I reread – look for another post to my favorite books series soon! And, as I’d hoped, I used the time that I was cleaning and doing other chores to listen to the backlog of podcasts I had downloaded. A new favorite I’d like to plug: After These Messages, which is a delightful analysis of TV commercials. It’s possible that the reason I’ve taken to it is because it fills the void in my life where TV commercials used to be, now that I’m not watching much TV — but I’m really enjoying it. In case you were wondering, based on my enthusiasm for season one of Serial, I have been listening to the second season, but I’m not nearly as enamored of it as I was the first season. Well, that’s all I’ve got for today. I know this is the moment in the year when many of us start to falter on our new year’s resolutions, but I think this is one I’ll keep up. I’m happy to be spending my free time on more productive ventures, which makes me feel like I actually have MORE free time, and don’t feel like I’m missing out on anything by not watching TV. I have a lot coming up in February – I’ll look forward to telling you about it in future blog posts!